Abstract: Wooden circles were constructed during the final Jomon Period in Japan (c. 3300-2500 cal BP). 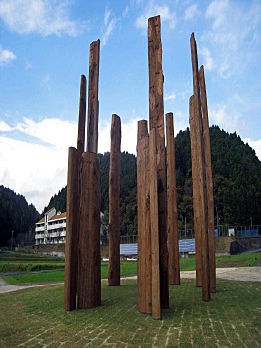 They consist of 6, 8 or 10 poles arranged in a circular configuration of 6 to 8 meters in diameter and have been excavated in the Noto peninsula region and the Toyama bay region, Central Japan. These poles are made of large chestnut (Castanea crenata) logs which were split in half, and their cut surfaces are always oriented outward. A pair of these poles seems to form a gate-like structure. The upper parts of the structure were almost completely decayed and lost; the base of logs were preserved and examined. 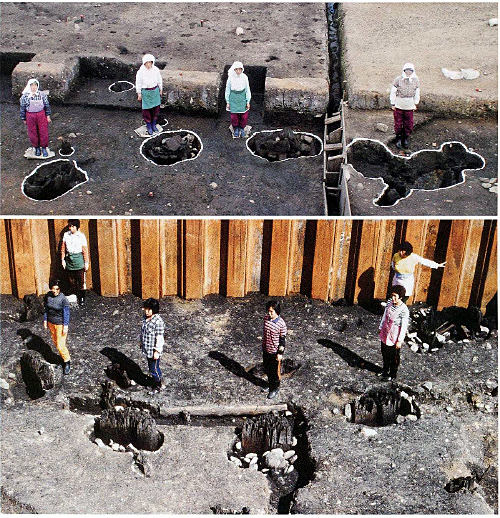 Although the wood circles have been documented at 16 sites, 12 of them included large pits arranged in a circular configuration without poles or only wooden poles without pits. Direct evidence of wood circles are found at only 5 sites; Chikamori, Mawaki, Yonaizumi, Sakura-machi and Teraji. The wood-en circles date from c. 3000 cal BP to 2540 cal BP. The circles from c. 3000 cal BP were 6 meters in diameter and the diameter of the remaining poles are about 45 centimeters. The examples from c. 2800 cal BP were 8 meters in diameter and the diameter of the remaining poles are about 80 centimeters. The people of the Jomon period were hunter-gather-fishers. According to recent studies, the cultivation of rice in paddy fields was introduced from the Korean peninsula c. 2900 cal BP. Research by Dr. Imamura proposes that it was cooler from c. 2800-2670 cal BP. Based on my original analysis, this paper presents new interpretations of these wooden circle features. Questions regarding the function and reconstruction of these features, including the question of whether they were buildings or ceremonial wood circles, are explored here.